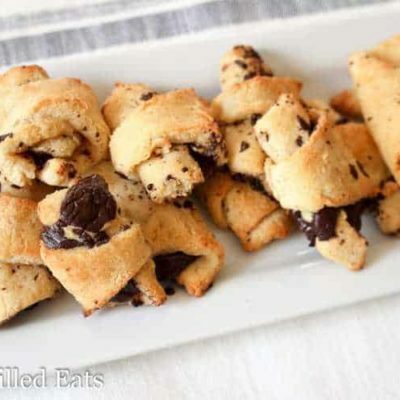 These Chocolate Filled Crescent Cookies are ideal for when you want something a tiny bit sweet after dinner with a good cup of coffee. Mozzarella dough might be the best invention ever. There is a debate about the origin of it but whoever was responsible is a genius. The first place I ever saw it was the amazing cheese danish at Up Late Anyway. Since then I’ve used my version in a bunch of different recipes. If chocolate isn’t your thing check out my Cinnamon Rolls and Caramel Pecan Sticky Buns. 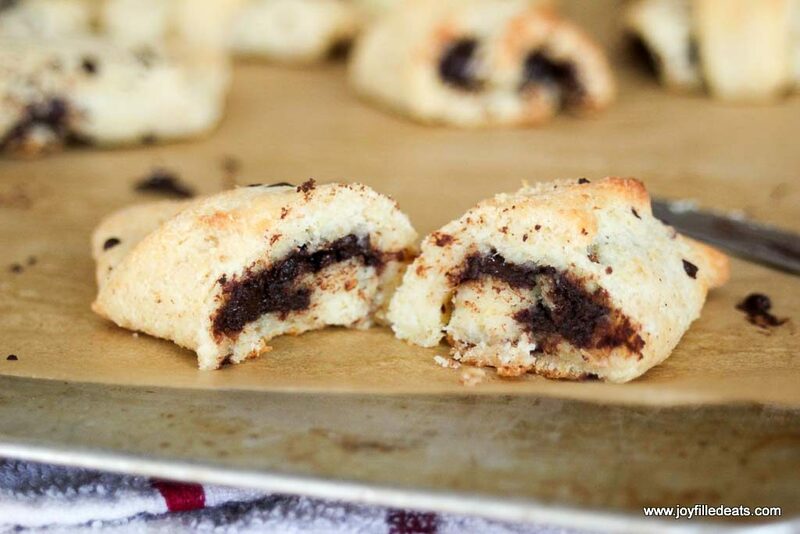 These chocolate filled crescent cookies are only slightly sweet if you use 85% dark chocolate. If you would like them sweeter you can add more stevia or use sugar-free milk chocolate such as Lily’s. These were inspired by the fabulous chocolate croissants I had on my honeymoon in Quebec. I hope you enjoy them! 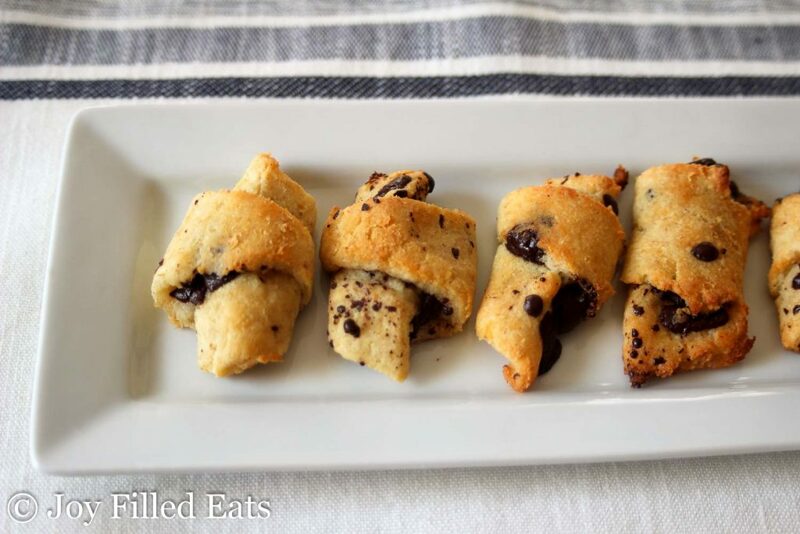 Chocolate Filled Crescent Cookies are grain free, gluten free, sugar-free, keto, low carb and a THM S. They are ideal for when you want something sweet. Microwave the mozzarella and cream cheese until it is completely melted. I normally do this in 30-second increments. It takes about 2 minutes. Add the butter. 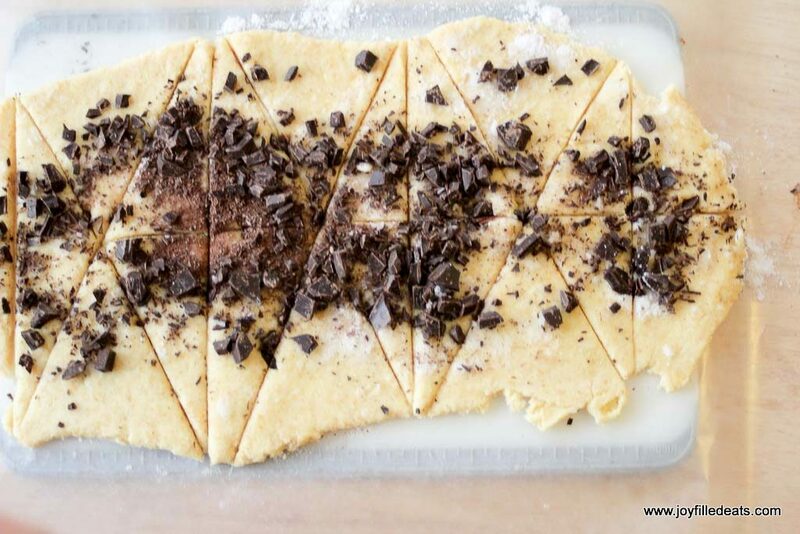 Then the easiest way to make this dough is in a food processor with the dough blade. You can mix and knead by hand if you don't have one. Just mix the baking mix, egg, and gentle sweet into the cheese until it is a uniform color. 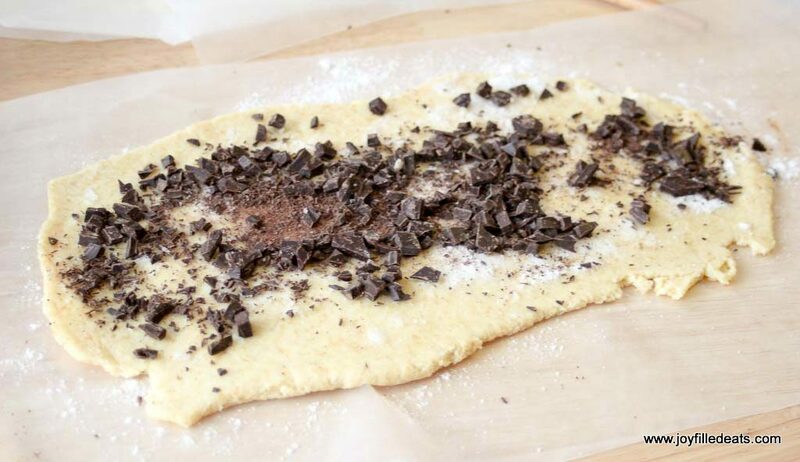 Once the dough is thoroughly mixed roll it out between two pieces of waxed paper or parchment paper until it is about a 11x15 inch rectangle that is 1/3 inch thick. 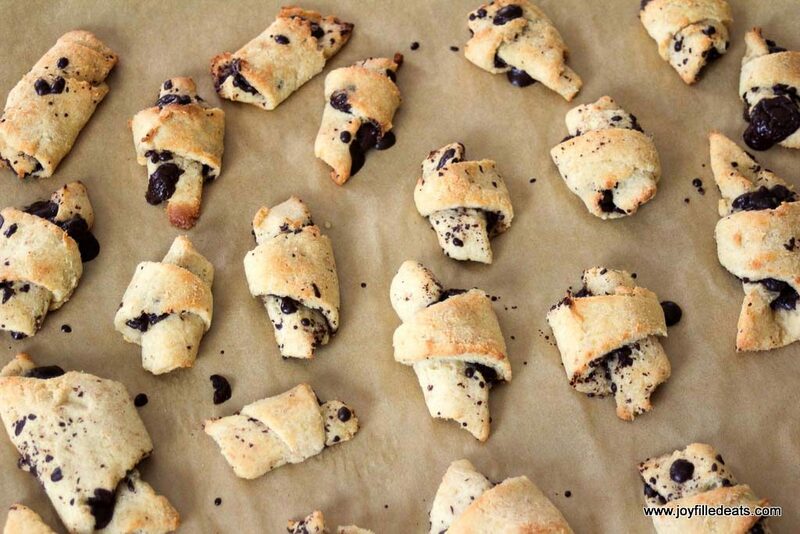 Roll up the triangles into crescents beginning with the wide end and put them on a parchment lined baking sheet. Bake at 350 until they are golden brown, about 20-25 minutes. Originally published March 1, 2016. Updated and republished February 27, 2018. « Thrive Market Coupon $60 of Free Organic Groceries! Hi Taryn! I can't seem to get the cheese danish link to work. Can you check? Any idea the carb count? I just added a nutrition chart. 2 carbs per cookie. .9 net carbs. Couldn't pass up a cookie made with cheese! 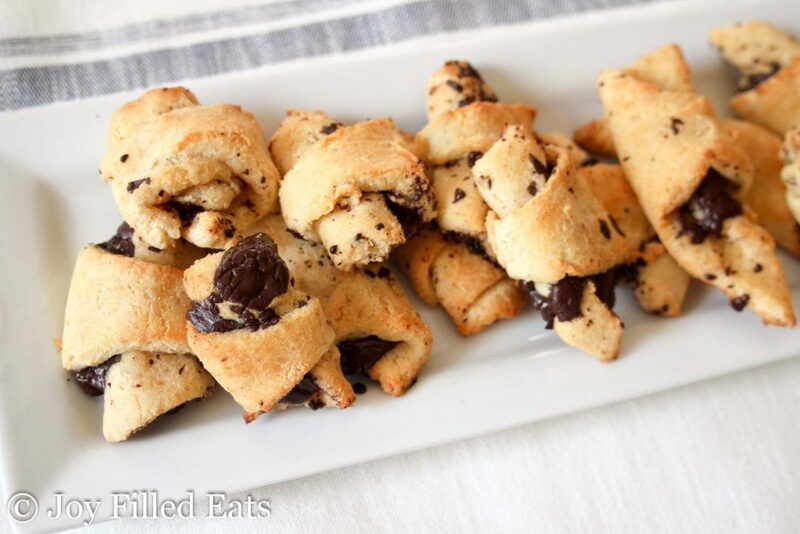 They were easy to make and I cheated by using mini chocolate chips. They came out pretty tasty. It took me eating an entire batch to figure out it was a texture thing that was off and not a flavor thing. Of course when you use flax seed the texture isn't like good old white flour. However I would make these again! 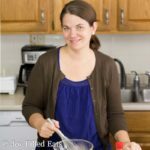 Hi Gail, maybe next time grind the flax until it is very fine. I'm normally lazy and use it straight from the bag but I prefer grinding it finer when I can. My cinnamon rolls and pecan sticky buns are made from the same dough. I use it in a lot of things :) I'm glad you liked them.